The U.S. Army will up-armor a pair of brigade combat teams over the next two years, the second and third such conversions as the Defense Department shifts its focus to the possibility of conflict with China and Russia. 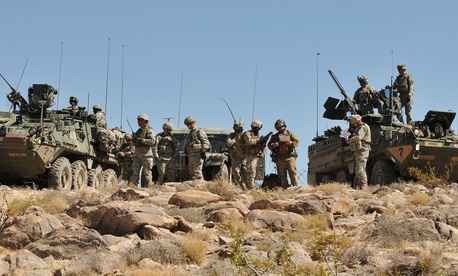 Next spring, the 1st Brigade Combat Team of the 1st Armored Division, stationed at Fort Bliss, Texas, will begin to switch from a Stryker brigade combat team to an armored brigade combat team. The 2nd Brigade Combat Team of the 4th Infantry Division, based in Fort Carson, Colorado, will become a Stryker unit the following year. "The Army leadership determined that we needed to convert two brigade combat teams to armor and Stryker in order to deter our near-peer adversaries or defeat them if required," Maj. Gen. Brian J. Mennes, director of force management, said in a statement on Thursday. The three conversions reverse a decade of reductions in armored BCTs—heavy units equipped with M1 Abrams tanks and Bradley fighting vehicles—in favor of the lighter Stryker and infantry units. But then, the U.S. was embroiled in counter-insurgency wars in both Iraq and Afghanistan, where heavy brigades were of less value. Armored BCTs, which are the descendants of the heavy Cold War-era divisions intended to deter and defend against the Soviet Union in Europe, lose their advantages in mountains and in complex urban terrain. There’s no public indication yet where the two units might deploy once they finish the conversion—a long, complex process that can take a full year. The first such conversion was ordered in 2016; that former infantry BCT in Fort Stewart, Georgia, has yet to deploy. But the National Defense Strategy, with its focus on near-peer adversaries, offers a few clues. The retired lieutenant general described the move as “trying to get more depth” in armored brigades. New heel-to-toe rotations in Europe that began in 2016 amid concerns about a resurgent Russia raised concerns that the new workload would strain the Army’s armored BCTs. Armored experts say it takes three BCTs to sustain a continuous rotation: one deployed, one returning, and one preparing to leave. The conversions, the Army said in a release, will ensure “a more balanced distribution between its light and heavy fighting forces.” It will bring the total number of armored BCTs to 16.